neutralize each other, so that there would be 110 horizontal motion at all. The vertical components, however, being in the same direction, will add to each other, so that the resultant of two beams of light polarized circularly in opposite directions and of equal intensity is a plane polarized ray. To return, now, to Zeeman’s phenomenon. Fig. 80 represents one of the sodium lines when examined in a direction at right angles to the magnetic field. The upper line represents the appearance when the light is polarized so that only horizontal vibrations reach the spectroscope.- If, however, the polarizer is rotated through 90°, so that only vertical vibrations pass, the appearance is that of the lower half of the diagram, the two side lines appearing and the central line disappearing. 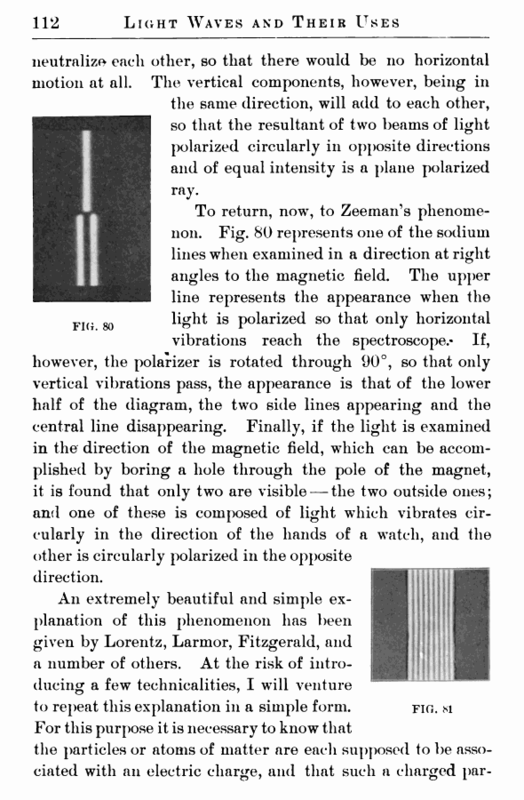 Finally, if the light is examined in the direction of the magnetic field, which can be accomplished by boring a hole through the pole of the magnet, it is found that only two are visible — the two outside ones; and one of these is composed of light which vibrates circularly in the direction of the hands of a watch, and the other is circularly polarized in the opposite direction. An extremely beautiful and simple explanation of this phenomenon has been given by Lorentz, Larmor, Fitzgerald, and a number of others. At the risk of introducing a few technicalities, I will venture to repeat this explanation in a simple form. 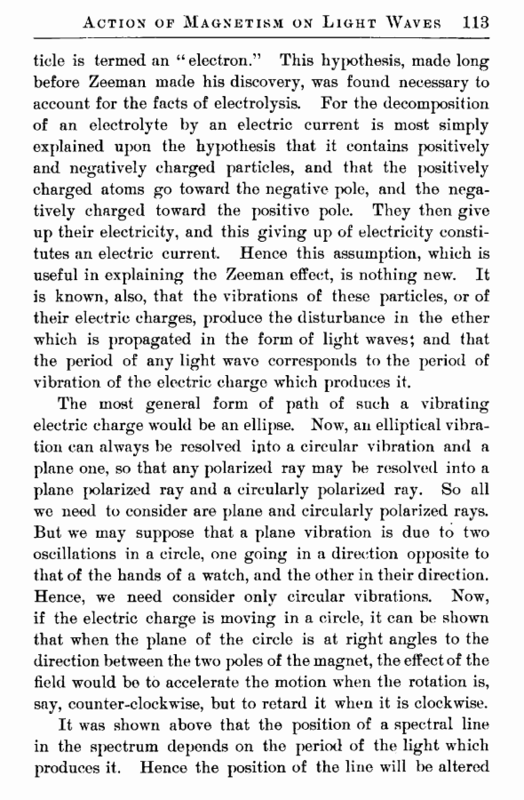 tide is termed an “ electron.” This hypothesis, made long before Zeeman made his discovery, was found necessary to account for the facts of electrolysis. For the decomposition of an electrolyte by an electric current is most simply explained upon the hypothesis that it contains positively and negatively charged particles, and that the positively charged atoms go toward the negative pole, and the negatively charged toward the positive pole. They then give up their electricity, and this giving up of electricity constitutes an electric current. Hence this assumption, which is useful in explaining the Zeeman effect, is nothing new. It is known, also, that the vibrations of these particles, or of their electric charges, produce the disturbance in the ether which is propagated in the form of light waves; and that the period of any light wave corresponds to the p>eriod of vibration of the electric charge which produces it. The most general form of p)ath of such a vibrating electric charge would be an ellipse. Now, an elliptical vibration can always be resolved into a circular vibration and a plane one, so that any polarized ray may be resolved into a plane polarized ray and a circularly polarized ray. So all we need to consider are p>lane and circularly polarized rays. But wre may suppose that a plane vibration is due to two oscillations in a circle, one going in a direction opposite to that of the hands of a watch, and the other in their direction. Hence, we need consider only circular vibrations. Now, if the electric charge is moving in a circle, it can be shown that when the plane of the circle is at right angles to the direction between the two poles of the magnet, the effect of the field would bo to accelerate the motion when the rotation is, say, counter-clockwise, but to retard it when it is clockwise.